My moſte pretious boke hath bene diſfigur’d by my Faitheleſs Humane Seruauntes. I had onelie begonne toe laie my thowghtes downe vpon ye paper vvhen my ſeruaunte came in my rome whan that I was owt of it and ſcribled barbarous poyntie lynes vpon .i. of ye pages, soe that ye fayreſt fruites of my pawe maie hardlie bee rede. I ſhal tye hir toe a ſculliones ſcratchynge poſte. Yet did ſhee leaue the othere page unmarr’d ſoe yt yow maie ſtil reade yt easelie. I maie yet ſpare hir lyf. Yet wil I giue hir a gode miouwynge toe. Stil wil I mourne ye spoylynge of .ii. of my deareſt thowghtes. 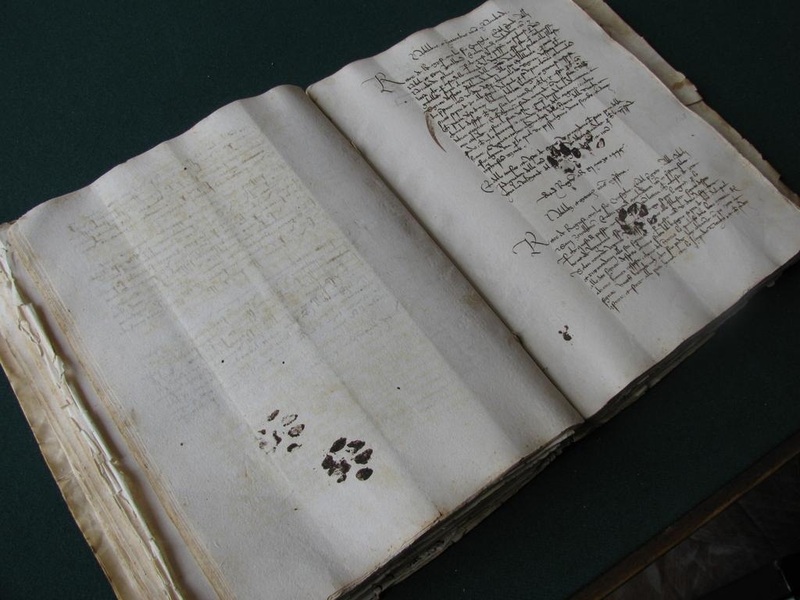 Theire bee ſubtile ones amonge Owr Longſeruauntes (of wch yow maie lerne moare in my Firſt Writt) whoe ſeme allmoſte toe vnder ſtande ovr Catte Speche and some tymes euen ovr ſecrete Bokes. We haue hearde them ſpeking of oure lerned diſcourſe on Longſeruauntes and ſaeinge yt wee wronge them wt ovr wordes. Thei lyk not toe heare them ſelues cald Seruauntes, for in theyr mad folie thei think thei them ſelues Kynges and Quenes. Thei wyſhe vs (for ſoothe) toe ſtile them Humanes (at ye least whanne thei canne heare vs) hence wee resolue ſoe to doe vnleſs thei be owt of heringe & ſyghte. Theire bee thoſe amonge theſe Humāes whoe maie not knowe, lokinge in my boke, howe tyme runneth on diuerſe pathes for humane beastes and for Cattes. Thei maie wonder at my talke of Land Fyſshe, ſayeing thei wolde neuer beleiue ther were anie Land Fyſshe in ye tyme of ye .iii. Quenes yclept Cat & ye .iii. other Quēes & ye verie fatt Kynge. But I tel yow Cattes tyme runneth in & owt of humane tym and wee can glimps muche that ye Humanes maie not perceiue until manie humane yeares be past. Anie catt can ſe ſyghts yt ye Humanes wot not. Euen ye wyſeſt Dames amonge ye Humanes them selues wil tel yow cattes can ſe in ye darke & ye fvtvre be darke ergo we may perceiue thinges yt ye weake eyd Humanes can not. Lande Fyſshe be shut vp in uerie harde shels wt owt euen a movthe or an eie. Thei can not propel ymselues as other Fyſshe can doe. Thei doe not liue in ye seas riueres or pondes & howe thei liue is a miſterie toe owr wiſeſt Philoſopheres. But ye Humanes doe knoe the secretes of wher toe finde them and thus ye Humanes erne theyr kepe. And ye Hvmanes being svbtile in theyr owne faſshione haue fownde waies to brake in toe ye shels & wynkle thē owte. Thus doe thei fynde uſe for theyr ſtraunge drie tonges yt growe vpon theyr pawes in stead of clawes. Lyke vntoe othere Ffyſhes the Lād Fyſshe uſeth not to ſpeke or crie owt. But gret Doctores of Naturall Philoſophye lyken ym som what toe ye Swanne that kepeth his counſell vntill ye howre of hys Deathe & than (as yt wer) ſummeth vp hys lyf entyre in a ſingle ſonge. For ye Land Ffyſshe allsoe makyth but one crie in hys lyf & that be ye worde Kshrmmmpt the whyche ys vnknowen in anie tongue of Cattes Humanes or Beastes. Whan that we Cattes heare that crie wee hasten toe ye haruest ſynginge hymnes of prayse & ſonges of reioycing yt we had from our Dams & Grandams of aunciente tymes. Longſeruauntes be mis-ſhapen gigantes that ſerue in howſes. Thei be monſtrous long and walke vpon but two Pawes, vsing ye otheres to catche ye harde ſhelde land ffyſh that dwelleth in high howſe-boxes. Theyr Fore Pawes be ſhapen for ſeruice wt ſoft & stvnted clawes. In place of Foretoes thei beare fiue drie Tongves in eache pawe wherewith to ſooth & ſtroak vs. Thei vſe theyr Pawe Tongves alſoe to catche land fyſshe and wynkle them ovt of theyr ſhelles. Thei fyll and bringe ovr dyſshes with lande fyſsh and water, the whiche thei fynd in ye enchauntede Fountaine. But being ſimple thei are eaſilie distract and oft wil goe ovt of ye howſe to fyſshe and returne wt naughte. Theyr Eies, Eares, & Snowtes all be rownd and weake. Wee feare no riuall Mowſe Hvnters amonge theyr nvmbre, for theyr ſenſes be but dulle. Thei growe blinde when ye ſunne goeth downe and ſoe thei crafte ſmale crvde ſunnes in theyr howſes. Theyr Tayles doe not growe or ells thei cutte them soe thei can not iumpe, as befitteth seruauntes. Thei be uerie vsefvll toe vs notwtstandinge, for thei hvnt lande fyſhe in hye plaſes and feede vs well. Theyr bodyes be made toe kepe ovr sleepe mattes warme. Thei be nigh naked in all but their enourmouſe heades, wherevpon groweth verie long furr like vnto ſpaniells eares eſpeciallie in females. Males maie haue a patch of terrier lyke furr beneath theyr mouthes. For shame thei hyde theyr bodyes vnder curiovſlie wroughte blanquetts. Theyr Kitts be abowt ye ſize of a growne foure pawede perſon but uerie ſtupide. Thei can not walke or ſpeake or euen pisse in ye sand boxe as our Kitts doe. Most dams bring forth but .i. kitte after much labour. The dam hath but ii nipels and muſt hold the kitt wt hir fore pawes while it sucketh. Thei oft ſlepe with vs, but knowe theyr place and doe not folow us intoe our cloſets and hidden beddes. Thei like to ſlepe on owre thicke ſofte raſed mattes, wherein at tymes thei make attempt to purre loudlie. Thei haue litel ſpeech but much ſounde. Thei maie learne owre names but forgett them againe, callinge vs euer and againe by diuerſe ſovndes and noyſes. Oft thei call by one name all perſons of owr kynde, as Cue T, Kyt T, Pouſe C, Damkat. Thei can barke lyk dogges at neede but can not purre vnles thei be a-ſleepe.